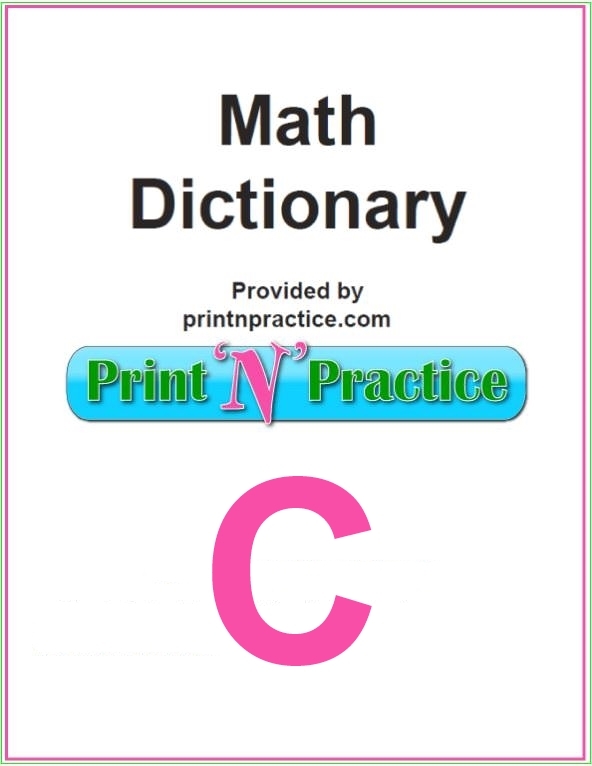 Welcome to our math words that start with C. Print the whole A-Z dictionary/glossary below. It's handy to have these for some math games. 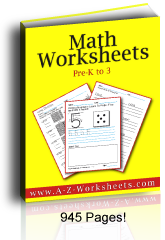 Math Words That Start With C: Calculator, Calendar, Cancellation.... Download or print the Math Dictionary below. Calculator - a machine for performing arithmetical calculations. Calendar - a chart that shows the days in a week and their dates in a month. Caliban puzzle - a logic puzzle in which one is asked to infer one or more facts from a set of given facts. Cancellation - simplifying the multiplication of fractions, the process of abridging operations in division by rejecting equal factors. If a numerator is equal to or a multiple of a denominator one of the numbers may be divided into the other. If the numerator and the denominator have the same number, these two numbers cancel out. If, after these, the numerator is larger than the denominator there is a remainder when they are divided. Capacity - the amount of liquid a container can hold. Capital of a Company - the money or other property invested by the partners. Cardinal Number - a number that indicates the quantity but not the order of things. Cartesian coordinate system - a standard method of locating points in the plane that uses pairs of numbers denoting distances along two fixed intersecting number lines, called the axes. The axes are perpendicular to each other and intersect at the origin of both axes. The system is names for the French mathemetitian Rene Descartes. It is also called a rectangular coordinate system. Cartesian Coordinates - are a set of numbers officially called “an ordered pair” that are in the form ( x , y ). Cartesian Plane - a plane made up of an x axis and a y axis. Catenary - a curve whose equation is y = (a/2)(ex/a+e-x/a). A chain suspended from two points forms this curve. Ceiling Function - the ceiling function of x is the smallest integer greater than or equal to x.
Celsius - a scale used on some thermometers to measure temperatures. Center - the point inside a circle from which all points on the circle are equally distant. Centimeter - metric unit of measurement: 1 centimeter (cm) = 10 milimeters (mm); 100 centimeters - 1 meter. Central Angle - an angle between two radii of a circle. Centroid - the center mass of a figure. The centroid of a triangle is the intersection of its medians. Centroid of a Triangle - center of a triangle. Century - a period of one hundred years. Cevian - a line segment extending from a vertex of a triangle to the opposite side. Chance - a way of expressing the likelihood of an event; the probability of an event expressed as a percent. Chord - line segment that connects two points that are on the outside edge (circumference) of a circle. Chronological order - the order of dates or times when listed from earliest to latest. Circle - a plane figure bounded by a curved line, called the circumference, every point of which is equally distant from a point within called the center. Circle - the set of points equidistant from a given point (the center). Circle graph - a graph made of a circle divided into sectors. Circular Cone - a cone whose base is a circle. Circumcenter - the circumcenter of a triangle is the center in a circumscribed circle. Circumcircle - the circle circumscribed about a figure, the distance around a circle, also called the perimeter of a circle. Circumference - the boundary of a circle. Cissoid - a curve with equation y2(a-x)=x3. Clockwise - moving the same direction as the arms on a clock. Coefficients - the numbers in front of letters in a mathematical expression. Combinations - how many different ways you can choose things from a set of objects. Combinatorics - the science that studies the numbers of different combinations, which are groupings of numbers. Commission - an allowance made to an agent for transacting business. Common Denominator - a multiple shared by the denominators of two or more fractions, necessary for adding and subtracting fractions. Common year - a year with 365 days; not a leap year. Commutative Property - this property of both multiplication and addition states that you can rearrange the order of numbers being added or reorder numbers being multiplied without changing the value of the expression. A property of real numbers that notes that, for any real numbers a and b, such that a + b = b + a and that a x b = b x a.
Compass - a tool used to draw circles and arcs. Complementary Angles - two angles whose sum is 90º. Complementary Probability - considering probabilities in decimal form, the sum of two probabilities equal to one. As a percent, the two probabilities are considered complementary if they sum to 100%. Complex Fraction - a fraction whose numerator, or denominator, or both, are fractional. Complex Number - the sum of a real number and an imaginary number. Composite - a number that has more than two factors. Composite Number - an integer that has other integral factors besides unity and itself. Compound Ratio - the product of two or more simple ratios. Compute - to solve problems that use numbers. Concave - curved from the inside. Concave polygon - a polygon in which one or more interior angles have a measure greater than 180. Concave Up - a curve is “concave up” when it is a concave shape, meaning curved like the inside of a bowl, with the two ends of the curve pointing up. Concentric Circles - circles that have the same center and varying radii. Concrete Number - used with reference to some particular unit. Conditional equation - an equation whose truth or falsity depends on the numbers used to replace the variables in the equation. Conditional Probability - the probability of an event occurring given that another event also occurs. Cone - a three-dimensional solid that rises from a circular base to a single point at the top. Congruent - two objects that are the same size and shape. Congruent figures - two geometric figures that are identical in size and shape. Conic Section - the cross section of a right circular cone cut by a plane. An ellipse, parabola, and hyperbola are conic sections. Conjunction - a statement of two conditions which must both be true in order for the statements to be true. Consecutive - one right after the other. Consecutive integers - integers that are 1 unit apart. Consistent equations - simultaneous equations that have a single solution. The graphs of consistent equations are lines that intersect at a single point. Constant Functions - stay the same no matter what the variable does. Constant of proportionality - a constant in an equaion that defines the relationship of two or more variables. In equation y = 5zx the number 5 is the constant of proportionality. Constants - things that do not change. Continuous Graph - in a graph, a continuous line with no breaks in it forms a continuous graph. Convex polygon - a polygon in which all interior angles have a measure less than or equal to 180. Coordinate - a number that is associated with a point on a graph. Coordinate plane - a plane with a coordinate system that can be used to designate the position of any point in the plane. Coordinate Plane - a plane with a point selected as an origin, some length selected as unit of distance, and two perpendicular lines that intersect at the origin, with positive and negative direction selected on each line. Coordinates - a unique ordered pair of numbers that identifies a point on the coordinate plane. The first number in an ordered pair identifies the position with regard to the x-axis while the second number identifies the position on the y-axis. Coplanar - objects that lie on the same plane. Coprime - integers m and n are coprime if gcd(m,n)=1. Correlation - a statistical measure referring to the relationship between two random variables. It is a positive correlation when each variable tends to increase or decrease as the other does, and a negative or inverse correlation if one tends to increase as the other decreases. Correlation Coefficient - a numerical value (between +1 and -1) that identifies the strength of the linear relationship between variables. A value of +1 indicates an exact positive relationship, -1 indicates an exact inverse relationship, and 0 indicates no predictable relationship between the variables. Corresponding Angles - two angles with the same relative position on two lines when those lines are cut by a transversal. Counter-Clockwise - moving in the opposite direction to the arms on a clock. Cryptarithm - a number puzzle in which an indicated arithmetical operation has some or all of its digits replaced by letters or symbols and where the restoration of original digits is required. Each letter represents a unique digit. Cube - a box formed by putting six squares together, connected at the edges; a geometric solid that has six identical square faces. Dice are examples. See about squares and cubes formulas here. Cube Root - one of three equal factors which produce it. Cubic Equation - a polynomial equation of degree 3. Cuboctahedron - a semi-regular Platonic solid, created by either truncating (cutting off) the cube one half the way into each edge or by truncating the octahedron one half the way into each side. Curve - the path traced by a moving point. Curved Surface - one no portion of which is plane. Cyclic Polygon - a polygon whose vertices lie on a circle. Cylinder - a rounded three-dimensional solid that has a flat circular face at each end. There are way many words that start with C than for some letters like X and W, so this page is fairly long. 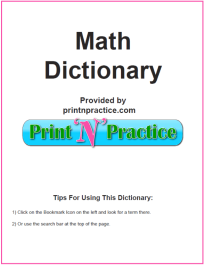 If you want, you can bookmark the following PDF math dictionary, download the whole PDF to your tablet or iPad, or you can print it to keep in your binder. 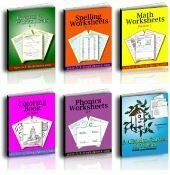 If you are homeschooling, this Math Dictionary will last you through the elementary years. The alphabetical list of links will take you to our other online pages for more Math definitions and formulas. We also have phonics words that start with C on our phonics worksheets page. Thank you for visiting our words that start with C.